Giants once walked the earth. And swam it, too. 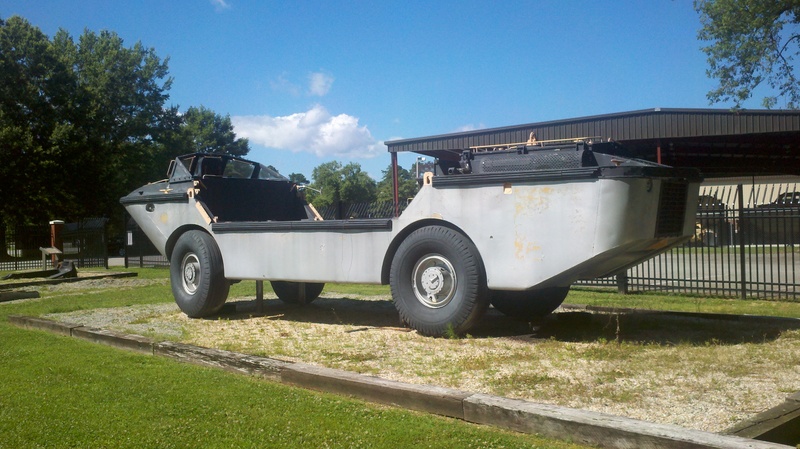 Those thoughts come to mind when viewing a rare surviving example of the Barge, Amphibious Resupply, Cargo (BARC), an amphibious cargo carrier developed and fielded by the U.S. Army during the early 1950s. On display at the U.S. Army Transportation Museum in Fort Eustis, Virginia is BARC 3-X, the third of four prototypes and the oldest survivor. 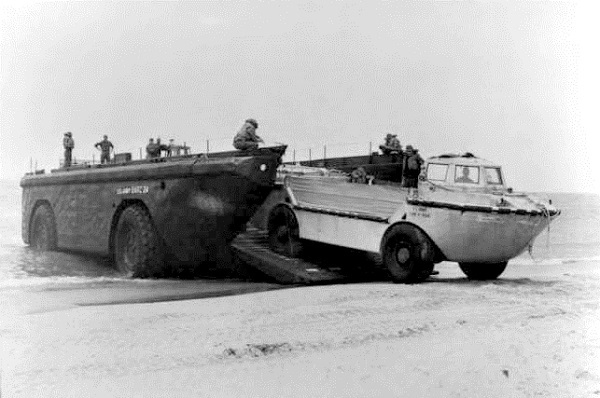 The BARC was one of a series of amphibious cargo vehicles developed by the U.S. Army during the Korean War to replace the DUKWs left over from the Second World War. 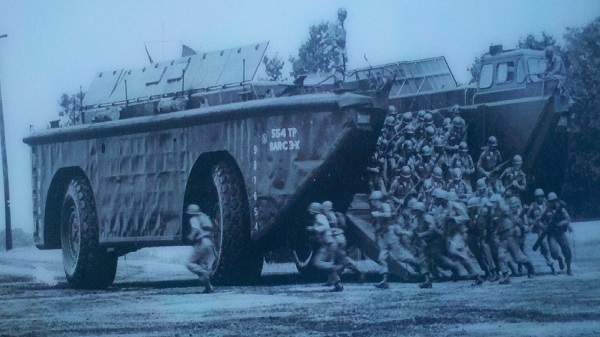 The DUKW had given yeoman service in both wars, but the Army saw that larger and more modern vehicles would be able to better perform the DUKW’s tasks in the Cold War. It therefore developed a range of new designs during the 1950s, each with far greater cargo capacity than the 2.5 ton DUKW: the 5 ton LARC V (Lighter, Amphibious Resupply, Cargo, 5 ton), the 15 ton LARC XV, and the 60 ton BARC. 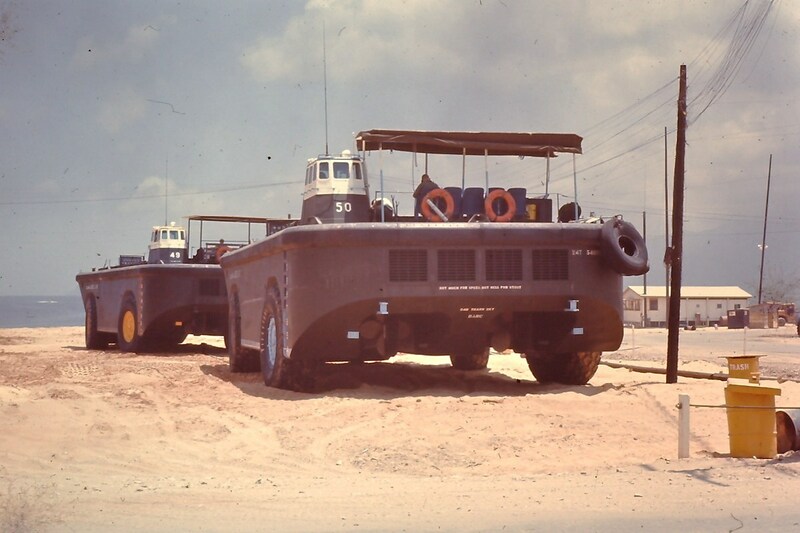 The BARC, developed by the Army and offshore oil rig manufacturer LeTourneau Incorporated, was the first to be ready for service, with four prototypes delivered and the design finalized by the end of 1953. Measuring 63 feet long and 27 feet wide, with an empty weight of 195,000 pounds, it was large enough for the LARC V, itself 35 feet long and 10 feet wide, to drive into it easily. Powered by four Detroit Diesel 6-71 two stroke diesels, better known as common bus engines, it had a maximum speed of 20 miles per hour on land and 6.5 knots on the water. Rated for 60 tons of cargo, it was large enough to carry an entire 125 man infantry company. The BARC would serve in small numbers for almost half a century. Total production was 55 hulls in addition to the four prototypes. They gave valuable service in the Vietnam War, and the Army Transportation Corps used them in numerous operations until the conflicts of this century, retiring the last BARC on October 15, 2001. BARC 3-X became the training craft for BARC crews from 1953 to 1963, then made it into preservation at Fort Eustis. 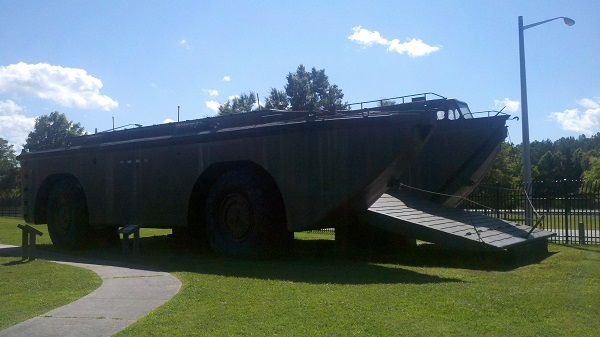 The U.S. Army Transportation Museum restored it and placed it in a display of amphibious vehicles that is open to the public. 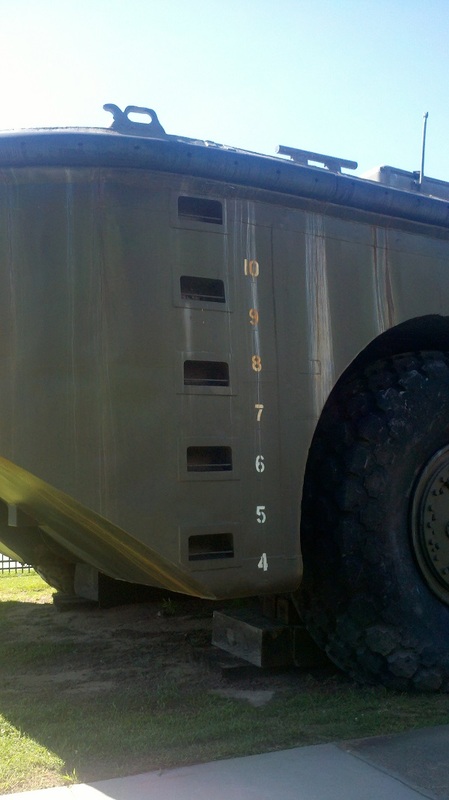 Towering over the viewer with tires nine feet high and gunwales more than twelve feet above the ground, BARC 3-X is one of the last survivors of a unique vehicle created for a now long-ago conflict. Today the U.S. Navy’s Landing Craft Air Cushion (LCAC) hovercraft performs the same function of transporting cargo from ship to shore and does it at much higher speed, so the world is unlikely to see the likes of the BARC again. Wow, that thing is huge, I never knew they made a landing craft this big. I was drafted into the Army in 1967 and was sent to Fort Story in Virginia. I was trained to operate both the BARC & LARC. They were used to off load cargo in Vietnam. This is a longshot, Dan, but my father Vernon “Sonny” Lollar was drafted at that same time and operated both of the same vehicles you mentioned above. Did you by chance serve with him? He was an Oklahoma native and a smaller statured man. I spent tours on the amphibs before and after my submarine era and I don’t recall carrying these on either the LSD or LST. Probably the Marines and/or Seabees never got them or perhaps I had a sheltered life. Amtracs were the common Marine landing craft and LCUs’/LCMS for the amphib constructions guys. Your first guess was right, Lee. The BARC and LARCs were exclusively Army vehicles, so they probably never saw the inside of an LSD or LST. Their interaction with the Navy would have been limited to being transported to a theater with other Army vehicles, then going ship to shore with loads. I think that the Lane Motor Museum has one of these – if not this vehicle exactly, then one similar. Once a year, they fire the thing up and invite the public to bring things down to the museum to be crushed by it. Those huge tires probably could crush a small car as easily as a monster truck could. Probably more easily, with its empty weight of almost 100 tons. What are some of the largest items that you witnessed crushed? I did not know about the Lane Motor Museum before, but now that I do, a trip to Nashville is on my to-do list. Yes they do. They have a video you can watch of how they managed to get the massive thing on site (they drove it!). They also have a video of it crushing the shell of a small parts car – a NSU maybe. The Lane is definitely worth seeing. A 20th century Noah’s Ark. But this one actually exists. Just what you need to survive in the post apocalyptic world. IIRC there was some type of BARC list on eBay or one of the government auction sites a few years ago. I couldn’t find a link so it’s either still for sale somewhere or somebody ponyed up the $1M asking price. I do like a vehicle that has a pilot house…..I would how many Eldorados you could fit in the middle…. A DUK in the middle of the BARC with an Amphicar in DUK! Theres one of those LARCs in Shepparton Vic what its doing there I have no idea but they are quite big much bigger than a DUKW. These were used in QuiNhon, Vietnam to transport frozen and chilled food cargo from ships to the Army depot. They could handle 1000 50 lb. cases of frozen meat or 800 cases of eggs easily. Cargo was loaded onto pallets, from the ship, then loaded onto the BARC which was alongside. In some of the pictures, you see personnel on the front. They are there to guide the pilot, using hand signals. The pilot is controlling from the stern. Four engines, one for each wheel, and steering front and rear. I was a BARC Engineer with the 14th Trans Platoon BARC at Fort Ord from 63 to 65. We were a STRAC Unit. We were alerted to Quinhon, Vietnam in 65 in support of the ARVN Air Force. We were the first unit thru Charlie Camp in Siagon, then flew to Quinhnon. Initially we carried bombs and ammo fron ship to shore to the ARVN air field near Quinhnon. Subsequently, we unloaded components of men and equipment of the 1st Division and 101st Airborne when they arrived in 66. Our CO was Lt Gerald Gould, the XO was a 2nd Lt. Koufman. 1st Sgt was Joe Spencer.